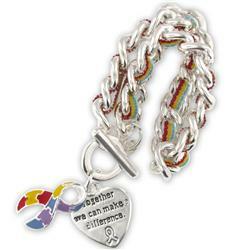 In support of Autism Awareness Month, Pistachio is proud to offer ASD Charm Bracelets for sale. Available in two designs, these bracelets are an excellent way to show your support. Each prominently displays the puzzle piece ribbon design that has become synonymous with the ASD cause and the multiple vibrant colors represent the diversity of individuals affected by the disorder. So next time you stop into Pistachio this month, be sure to pick one of these bracelets up for yourself, a loved one or a friend. We appreciate your support! Pistachio is dedicated to the Fight for Autism: Cope, Study, Cure.